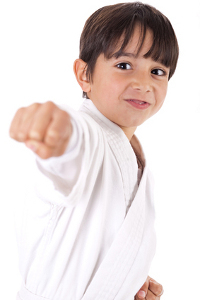 The Kids Power Karate Program offers traditional martial arts training to children ages 6 through 12 and emphasizes self-defense, physical fitness, conflict resolution, teamwork and anti-kidnapping techniques. This program is designed specifically for children and teaches prevention first. It does not promote active aggressiveness but teaches children to respect themselves, others and the skills they learn. This introductory program to traditional Tang Soo Do has been commended by many communities, law enforcement personnel, teachers and parents for the positive impact it has on children. It is over a 20-year proven program that is positive, fun, exciting and educational. There is no better program for kids!